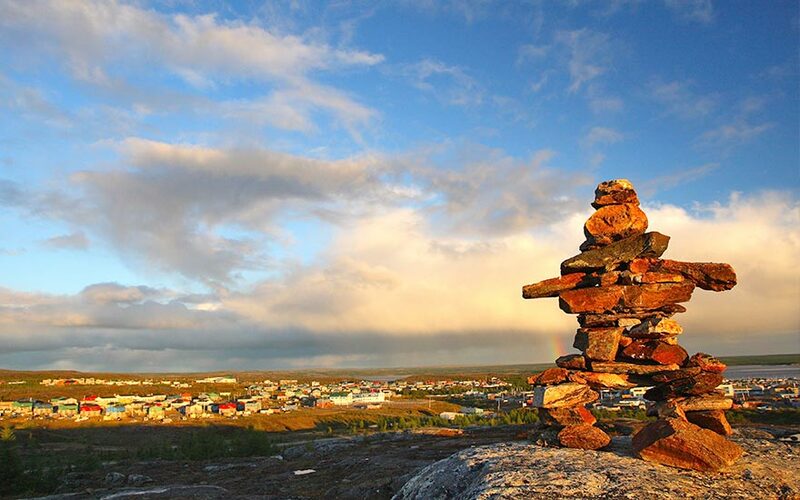 Kuujjuaq, Nunavik's largest community, is located on the west shore of the Koksoak River, about 50 km upstream from Ungava Bay. Daily life in this community is closely tied to the mighty river. The ebb and flow of its tides are continually altering the landscape and they impose their rhythm on the practice of traditional summer activities. The boreal forest is present around Kuujjuaq. Patches of black spruce and larch stand in marshy valleys. Kuujjuaq also witnesses annual migrations of the George River caribou herd. These animals pass through the region throughout August and September. Kuujjuaq was known before by another name, that of Fort Chimo. 'Chimo' is a mispronunciation of the phrase saimuk, 'Let's shake hands!' Early fur traders were often welcomed with this phrase which they eventually adopted as the name of the trading post. The first Europeans to have contact with local Inuit were Moravians. On August 25, 1811, after a perilous trip along the coasts of Labrador and Ungava Bay, Brother Benjamin Kohlmeister and Brother George Kmoch arrived at an Inuit camp on the east shore of the Koksoak River, a few kilometres downstream from the present-day settlement. Their aim was to convert "the Esquimaux to Christianity." According to the journal kept by Brother Kohlmeister, Inuit of the Koksoak River were very interested in having a Moravian mission in the area. Around 1830, the Hudson's Bay Company (HBC) started the fur trade business in Nunavik by establishing their first post on the east shore of the Koksoak River, about 5 km downstream from the present-day settlement. The post closed in 1842, then reopened in 1866. At that time, Inuit, Montagnais and Naskapi came to trade at the post. The construction of a U.S. Air Force base (Crystal 1) in 1942 on the west shore of the Koksoak River, the site of today's settlement, and the occupation of the site by the American army between 1941 and 1945 sped up the development of the community. After the end of World War II, the United States turned the base over to the Canadian government. In 1948, a Catholic mission was established, followed by a nursing station, a school and a weather station. When the HBC moved upstream closer to the airstrips in 1958, it was followed by the remaining families that still lived across the river at Fort Chimo. In 1961, a co-operative was created. With its two airstrips, Kuujjuaq is the transportation hub of the entire region. The village boasts a number of hotels, restaurants, stores, arts and crafts shops and a bank.